Paul Lambert unwittingly provided a pithy summary of the Wes Hoolahan conundrum long before either of them had any connection with Norwich City. That little challenge about fitting in has been repeated throughout Hoolahan’s career. Successive managers at successive clubs have marvelled at his “great left foot” and his cleverness, but have torn their hair out while trying to shoehorn him into whatever formation they favoured. Of all Hoolahan’s perceived weaknesses, an inability to suit a rigid 4-4-2 or similar has been the one that has most frustrated employers. So this cannot be the sort of hagiography you will read elsewhere. There are too many binary opinions about footballers, declaring them either completely useless or utterly brilliant. If we want accurate appraisals, they must be more nuanced. 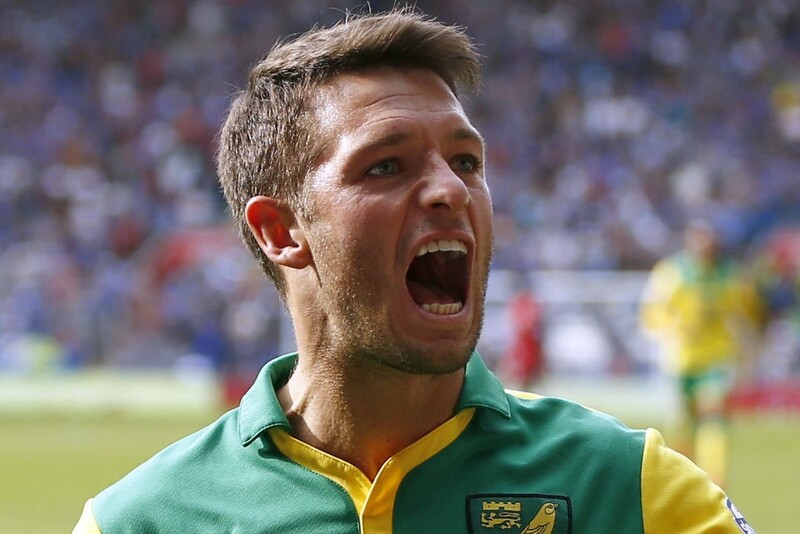 And Mr Hoolahan’s days at Norwich have been pockmarked by daftness and disputes. Yet, as he prepares for his last game in yellow and green, many are choosing to forget his spats and disasters. That’s OK, because it is the fact that his genius is not unblemished that made his flashes of wizardry so exhilarating. We knew that he didn’t dip glibly into his bag of tricks. We knew that he was sometimes performing perilously near the extremity of his ability, stretching and straining to keep his balance and the ball. At any minute the conjury might fail. So when the trick worked — when a beguiled defender was dumped on his bum, or an improbable pass threaded its way to a teammate — we shared a collective moment of awestruck wonder. Look at that! Look at that! And if the trick didn’t work — if the conjuror’s cards spilled onto the floor — well, we still adored his audacity. We forgave him instantly and waited for the next attempt at sorcery. Wes — like Elvis, Cilla or Delia, just his given name is sufficient — was born in North Dublin. His father says baby Wes kicked a balloon about in his cot and was throwing dummies as soon as he had discarded his comforter. He played football on the streets and then for a famed youth team called Belvedere from age eight to 18. Other lads got trials at 14 and 15, but Wes was tiny and the trials didn’t come until he was 17 — and then the English clubs involved thought he was too frail. Sunderland, Leicester, Millwall and the club in the Suffolk town that tried in vain to become a city all gave him trials but then didn’t even bother to contact him again. Ha, ha, ha, ha! Ten derbies for Norwich, no defeats. That penalty in the play-off semi-final. Ha, ha, ha, ha! Wes joined Shelbourne, who won three consecutive League of Ireland titles and reached the third qualifying round of the Champions League in 2004. In January 2006, Lambert telephoned Wes and offered him the chance to play in Scotland. Livingston were rock bottom of the SPL and Shelbourne manager Pat Fenlon said that going there would be a waste of Wes’s talent. There were rows. Wes was adamant about going. He went. But a month later Lambert resigned after seven consecutive defeats and at the start of the following (2006-07) season Wes went on a season-long loan to Blackpool. His Livingston contract had a £75,000 “release clause” and the plan was for Blackpool to pay that in instalments during the loan, together with other loan fees, and Wes would become a Blackpool player at the end of the season. Whatever football dreams Wes had enjoyed as a lad, they can’t have featured joining a club who had just finished 19th in the third tier, but he established himself in the team in a play-maker role and, in May 2007, appeared in the play-off final at Wembley as Blackpool beat Yeovil 2-0. Blackpool boss Simon Grayson then tried to complete Wes’s signing. But Livingston said Blackpool had been late with several payments during the loan and so the release clause had been invalidated. They said £250,000 was a more appropriate fee. Not for the first or last time, Wes had his own view. He promptly agreed two-year deal with Blackpool, stayed and trained with them. Blackpool successfully appealed to FIFA to get him registered and Wes kicked off the 2007-08 season in the Championship. He faced Norwich four times in his time at Blackpool – twice in a 2006/07 in a fourth-round FA Cup tie that City won in a Carrow Road replay, and twice in the League in 2007/08 when it was one win each. In the summer of 2008, Glenn Roeder signed Wes for Norwich for £250,000. The Irishman was already 26. He’d had just one season in the Championship. It didn’t seem a very exciting deal to Norwich fans. Wes’s international career had stalled too. He’d won under-21 caps and had been an unused sub for the senior Irish team while still at Shelbourne, but by 2008, Irish manager Giovanni Trapattoni had only given Wes one senior cap and wanted an ordered, pragmatic approach that Wes didn’t fit. Wes got the first goal in a 4-0 win over Barnsley, but we all know how the season unfolded and ended. Wes was injured in March, though, and so was not on the pitch when City were relegated to League One. So let’s pause and think about that. Wes was 27. He could not have expected too many more seasons in the game. His club were going to be in League One. Other players couldn’t wait to get out. But he stayed. He had the promise of moving on if things were not going well, it’s true. But he stayed. I would love him for that, even if he’d done little more for the club I care about. We all know how season 2009-10 began: with that 7-1 drubbing at home to Colchester. Wes was in our team that day. And when City then poached Colchester’s manager, he thought Wes was part of the problem. Lambert exiled a group of players, including Wes and Gary Doherty, and told them to train with the kids. But neither threw strops, and both proved Lambert wrong. In fact, Lambert devised a system built around Wes: a midfield diamond, with Wes at its top point. And in that system Wes was the first line of defence as well as the fulcrum of attacks. If Norwich lost possession high up the field, it was Wes’s job to hassle the man on the ball as, behind him, City’s narrow midfield filed across into position. With the ball he was a class above anything League One had to offer. He scurried and scampered, teased and tormented. He was magical. City were champions. My favourite Wes memory comes from the following (2010-11) season, however: the game at Leicester in March 2011. On the previous Saturday, at home to Preston, City’s charge up the Championship faltered. Preston took the lead, Grant Holt equalised, Wes stepped up to take a penalty — and chipped it straight at the grateful goalkeeper. It was City’s second consecutive draw, and a real setback. So off we trooped to Leicester on the Tuesday night. And as soon as Wes came out for the warm-up, we told him exactly what we thought about his dopey penalty against Preston. We sang the song. You know the one. Nah-nah, nah-nah, nah-nah, nah-nah, nah. Wes-ley Hoo-la-han, Hoo-la-han, WES-LEY-HOO-LA-HAN! We forgave him. We treasured him. We loved him. And we sang the song throughout the game. He responded by being absolutely, untouchably unplayable. He scored the first goal. A flaming header, for goodness sake! Norwich won, and promotion was back on. Here’s Holty talking about his third goal in the hat-trick in the derby that season in Tales 1. But even in that barnstorming season, with its plethora of drama, late goals and glory, Lambert was not averse to changing the system and squeezing Wes into a less-accommodating role. And the following season (2011-12), in the Premier League, Lambert frequently abandoned the diamond and often “rested” Wes. I recall the 3-1 League defeat at Chelsea in the third game of the season. Wes was playing out wide and he gave the ball away once to often for Lambert, who hooked him off after 67 minutes. When Chris Hughton took charge at Norwich, for the 2012-13 season, Wes forced his way into regular selection by his country. I believe Hughton, who won 53 caps for the Republic, played a part in that. But the 2013-14 season brought the episode which very nearly ended City’s love affair with Wes. On the first day of 2014, Wes had a spellbinding game at Palace, and Hughton, who, like others before and since, had been unsure the Irishman could be trusted to play a defined role, resolved to give him a long run in the side. But Lambert let it be known he was interested in buying Wes for Aston Villa and — what a happy co-incidence for Villa! — Wes announced that he was injured and so couldn’t play in the FA Cup against Fulham, which would have left him Cup-tied. Then he made formal transfer request. Hughton turned down that request but declined to select Wes after the Cup games (City lost in a replay) and did not recall him until late February. Then, when City played Villa Hoolahan pointedly did not celebrate when he scored the first goal of the game. Message-board warriors called him a traitor. Wes told the club’s website: “I certainly didn’t mean to disrespect anybody with the celebration and I’m sorry if anyone’s taken it the wrong way because I was over the moon with my goal. I’ve got so much respect for the Norwich fans because they’ve given me a lot of support over the years. I did a fist-pump and throughout the whole game I ran my heart out for the fans and for the team”. You did Wes. You always did. And we forgave you. We always did. Because you could do magic. Because you are a special player. Because you were our special player, for a decade. Because you stayed. Because you were at the heart of a charge up the divisions when we climbed 54 places in three seasons. Because you were too classy for the leaden opposition in the play-off semis. Because at Wembley you joined up all those intricate passing patterns. Because even this season, when there is so much sideways passing, your first instinct has always been to pass or run forwards. Because you’re not afraid to fail. Because you’re not afraid to dare. Because you’re Wes. “Not for the first or last time, Wes had his own view. He promptly agreed two-year deal with Blackpool, stayed and trained with them. Blackpool successfully appealed to FIFA to get him registered and Wes kicked off the 2007-08 season in the Championship. “He faced Norwich four times that season as a Blackpool player (one win each in the League and a fourth round FA Cup tie that City won in a Carrow Road replay).! Mick, you need a sub behind you as you’ve made the sort of mistake you chastise the local press for – we actually played Blackpool in the FA Cup in 2006/7. I seldom chide local papers, especially as I know most have no subs now. Anyone can make a gaffe – especially when writing in an unreasonably torrid rush as I nearly always do. We’re so lucky on MFW to have a live moderator as in Gary so there are no personal nasties getting through. It wasn’t exactly a critical error in Mick’s article in the first place. Our blessed local media does have subs but no capacity for proofing before stuff goes online. Their failure to correct mistakes later is rank, I would admit, and smacks of a lack of professional pride. Have a great Saturday Wes – I know I will. That FA Cup was the first time I had seen Wes. I relayed that in a comment the other day a Tuesday Can’t remember the date. but February 2007 Peter Grant was the Boss . I believe that also in the Blackpool team was a David Fox who ended up in City colours and Adrian Forbes ex city lad..
We had a lot of good players then. Wonder why they were collectively so inept…. Thanks for that Mick. Excellent summary. Brilliant read, really enjoyed it. We’ve forgiven Wes for his occasional rants, just as we forgave Flecky for stating his willingness to “walk barefoot to Leeds over broken glass” a few years ago. Fickle lot us football fans! Whatever, I wish Wes all the best, wherever he ends up, even if it’s playing for Birmingham against us next season. He’d be sure of a great reception. I remember him saying he’d walk the length of the M1 to get there though. Funny how like several others he returned here to live and is deservedly such a well-repected figure in this area! Hi Mick, a very good read except for this below. Wes — like Elvis, Cilla or Delia… all good but why oh why put Delia in with these celebrities – that was uncalled for. Living in Blackpool for my sins since 1984 I would go to the occasional game whenever home from abroad and Blackpool have always had a knack of finding the odd gem or two – Hughes, Ball, Sinclair, Stewart to name a few – and Wes comes into that category; sold on for a profit. Whenever, over the years, I have gone to City games away from home, I usually sit with the home supporters as that are the only tickets available at short notice, Wes gets more than the usual abuse from the home supporters – but most grudgingly would want him to play for their team. City, as we know, are not open for investment and we are told now that it might be looked at but no one is interested. As I have mentioned previously, I live in Blackpool and have watched with great interest in the long-running feud between supporters and the Oystons. As of today, they have announced a major development with investors having done due diligence and the last paperwork to be signed in the next few days. At this time there is no indication whether Owen and his daughter are staying on, the investors want to meet the supporters and get the club back up the league with a five-year plan of investment. If Blackpool with all this turmoil can get investment why can’t City? Heaven forbid that we should mention the name of our joint owner in a piece about Norwich City. Even more to the point, “Delia” is in a number of dictionaries as a word meaning to prepare a meal in the style of Delia Smith. Delia is a very good example of someone recognised by her first name alone and therefore it is entirely appropriate for Mick to cite her as an example. Your objection is as bizarre as it is etymologically incorrect. Agree.anything even remotely positive about the Smiths is condemned or ignored on this site. All part of the polarisation unfortunately. MFW is not what it was. Bit harsh Richard (the bit about the Smiths, not the ‘not what it was’, which may be true). The comment was made in response to an article by Mick, who is clearly supportive and Delia and Michael. We have a roster of over 20 writers, and across them is a fairly even mix of Delia supporters, Delia dissenters and those in-between. I can’t agree that ‘anything even remotely positive about the Smiths is condemned or ignored on this site’. The whole article Mick wrote was good and it was about Wes. I am not knocking what the Smiths have done gor the vkub in the past and was sad that Mick knowing some of the resentment at this time for the smiths had to mention Delia. Mick supports the Smiths and that is his choice, my choice is that it is time to go many years ago she said if she thought that she could no longer take the club forward it would be time to leave haven’t we reached that time. No one wants to see what they gave done for the club degenerate into bad memories least of all me. I just can’t understand the messages coming out that there are no investers interested in city as was reported last year when all around clubs are getting investers, Wolves, Blackpool, Charlton, Leeds, to name a few and city has a much better recent history in the Premiership than all of them. I as a supporter will always be grateful to Watlin followed by Delia in saving and progressing the club but it is time for a change not handing over the club to a nephew that will have a trust to control his actions in the club, where it will still be under financial constraints. Is it OK if I mention Cilla again, though? I mean she supported Liverpool. You are right Gary, my comment was a bit harsh. I guess I was annoyed at a tribute to one of the greatest players I have watched in my 60 years of supporting City became yet another dig at Delia. It seems unnecessary. There was quite enough of it last week when Connor, Martyn and Craig all posted interesting and balanced pieces about many issues but were each turned into condemnation of the owners. Even you were so bored at Preston that you resorted to the familiar default position. Bash the owners. All becomes a bit repetitive. That is not denying there is a considerable and justifiable debate to be had and I for one readily admit I don’t know the answer but does it really need to be dragged into almost everything? Just for the moment let’s enjoy Wes one last time. Fair comment Richard, and noted.